The transformations of cakes over the years have stepped up two fold. There are now as many options for the cake alone as there are options for the gown. Today, many bakeries offer an extreme variety of flavors, Liqueur-based cakes, adult flavors such as cappuccino, citrus flavors, particularly orange, lemon and lime, curd filling between layers often enhances these flavors, and even the option of a Wedding Cheese Cake. Of course, if she prefers to play it safe, traditional white or yellow cakes are still delicious. Perhaps the biggest change in wedding cakes appears in their decorations and icings. 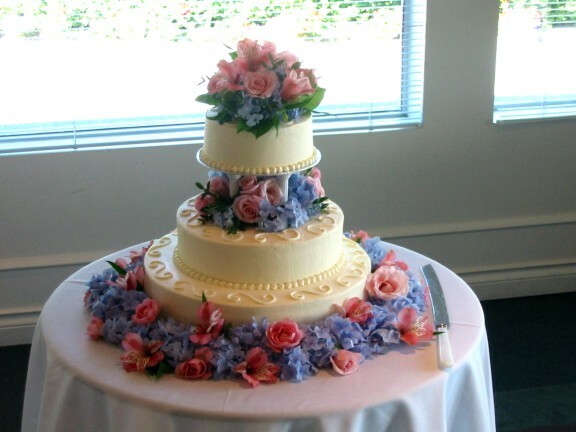 Brides still love cakes decorated with fresh or frosting flowers. 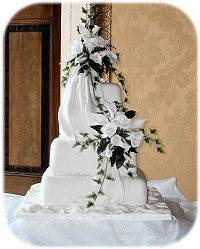 But less traditional decorations bring a new creativity to wedding cakes. Icing bows and ribbons make fanciful decorations. Another creative touch sure to garner "oohs" and "ahs" are blown sugar bubbles or fondant bubbles tinted to look just like the real thing, iridescence and all. Other fresh looks include basket weave icing, fondant fruits and a lovely faux-brocade decoration.” There’s a lot of non-traditional wedding cake decoration," the baker reveals. "Brides are paying more attention to the overall construction," a local baker says, noting that today's wedding cakes can assume shapes from an ornate hat to a stack of gifts. Brides who opt for these shapes want something very personal and unusual to grace their reception. 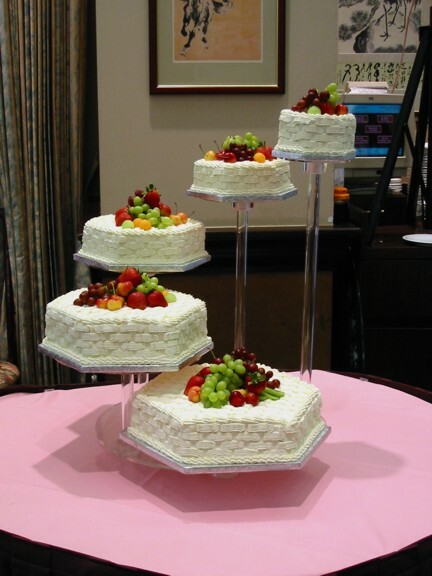 A combination of shapes, such as a square tier combined with several round ones, also give wedding cakes a unique presence. Some brides even opt for very tiny miniature wedding cakes, one for each guest. These diminutive cakes can assume any shape, and might even be topped with a second tier. How much cake to order can be a confusing gamble. Brides should consider several factors when consulting with their baker before coming to a final decision: How many guests will attend? How large will each serving be? Is leftover cake desired, and if so, how much? Will the bride and groom retain a small tier or portion of the cake to freeze until their first anniversary? The number of servings it yields determines the price of a wedding cake. Brides should be aware that serving sizes differ widely from bakery to bakery. They must make sure they understand just how big a serving size is and communicate that to whoever cuts the cake at the reception. Cakes can cost anywhere from a low $1.50 per serving to upwards of $3.00 per serving. In general, the more avant-garde and specialized the cake, the more expensive it will be. If cost is a major consideration, a traditional tiered or simple rectangular white or yellow cake will probably be the least expensive. Wedding cakes are complex, delicate constructions, ones that definitely require professional handling. Most bakers include the cost of delivery and set-up in the price of the cake. If a particular baker does not, it is definitely worth the extra charge to relieve the bride of the stress and headache of coordinating this herself. It is a small price to pay for peace of mind and a flawless cake. Bakeries have the correct vehicle in which to transport a wedding cake and bakers know how to assemble one on site. Bakers who deliver also bring along equipment to repair any minor dings a cake might acquire along the way. Many supply decorative cake knives, but some do not. In that case, the bride will have to supply her own. If the bride has chosen a tiered cake, she may be responsible for returning columns and other items to the baker after the wedding. Finding a baker/confectioner to fit your needs will take a little research and leg work, but it's definitely worth the time. Check ads, ask friends and family for referrals, and visit the Bridal Show to see a wide variety of bakers/confectioners. Most have cakes and other treats on display, and even samples to taste. Set up appointments with several different shops and then go in and view photos of their other creations. Consider asking for references. Sample the wares. And above all, enjoy the process! After all, it's your wedding cake and what could be sweeter than that? Make sure the person you have placed in charge of the cake cutting is familiar with the directions that follow. Remember, you probably will not cut the whole cake! To begin, always use a sharp, thin knife. The cuts should be made by first inserting the knife straight down into the cake, and then by pulling the knife at an angle toward the outer edge. Before the next cut, wipe the knife clean with a damp cloth. Remember, the top layer is usually saved for your first anniversary. It is recommended the saved cake first be covered and frozen over night, then sealed in plastic wrap and placed in an airtight container, and finally placed in a freezer for best results.